An Entire Genus Of Spiders Is Named After The Cast And Crew Of Which Movie? In 2012 researchers working at São Paulo’s Instituto Butantan discovered an entirely new genus of goblin spiders in the Brazilian Atlantic Forest and promptly named every species in the genus after the cast and crew of the 1987 blockbuster movie Predator. Why name every one of the spiders after Predator 25 years after the film was released? 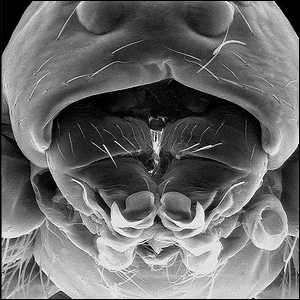 While we’re sure at least one of the researchers was a fan of the popular action sci-fi film, the most pressing reason was that the spiders have a chelicerae (the mouth parts of spiders, seen here highly magnified) that strongly resembled the mouth of the unmasked Predator species. The scientific names of the various species include P.schwarzeneggeri (named after the lead actor, Arnold Schwarzenegger), P.blain (named after character Sgt. Blain Cooper, played by Jesse Ventura), and P.mctiernani (named after film director John McTiernan), among others.